Did Turbos Leave the Factory with Undercoating? I have seen some really well restored Turbos over the past few years. Some of them are undercoated in the wheel wells and floorpan with black undercoating with a light texture. I also saw a really nice car but the entire floorpan and wheel wells were painted silver, as the car was Polaris, and was cleared. I was wondering if anyone knows how the Turbo actually left the BMW factory- with or without undercoating? Also, if they did not leave the factory with undercoating, was the floorpan and wheel wells painted the same color as the car? Any help would be much appreciated. I do not believe any BMW left the factory with an additional undercoating, this was something the individual dealers would have done or possibly done at the port when they arrived in the US (obviously not Turbos). The dealership I worked for did not do it unless someone specifically asked for it and we sent them out to have it done. We got a few dealer trade new cars that had been undercoated but none of them came from BMW that way. There is the texture under the paint is often referred to as "sprayable seam sealer" or Shootz that is the same texture you will find inside the trunk etc. The underside of the car and wheel wells were always body color. There is some discussion on a brush on black paint behind the grills on the vertical bars under the hinges, I have seen them both ways right from the factory ( I decided against it when I restored my car mostly for personal reasons) we found no indication that my car had ever had it. I believe that the Turbos were the only 2002s to leave the factory with undercoating. My research shows it was Tectyl by Valvoline (Europe) and is / was a sort of Asphalt product disolvable by mineral spirits (but not after 40 years). If you want further information on that product, let me know. 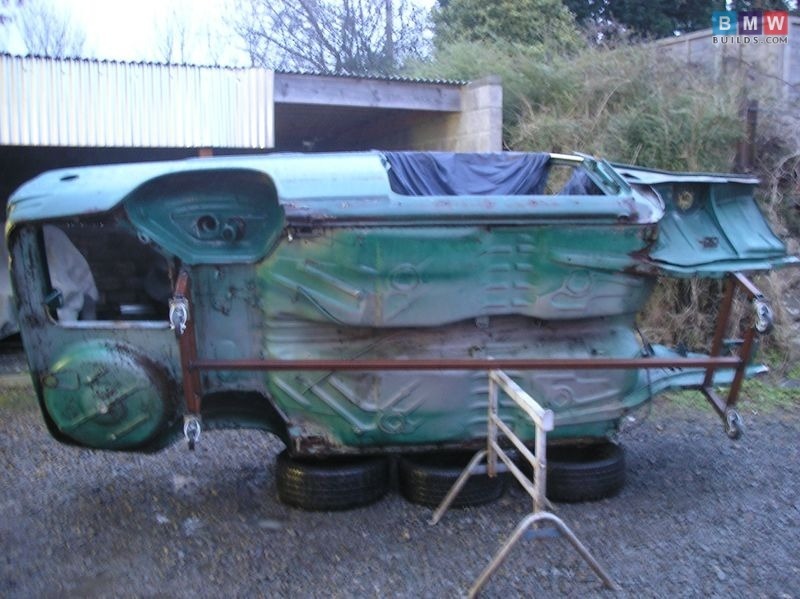 One picture shows in "the restorer's reference" p155 by James Taylor., however subsequent pictures don't show it on what looks like an unrestored car. I have images of many cars and some have it, some don't. It could be that in a restoration the whole body was stripped, removing the undercoating. 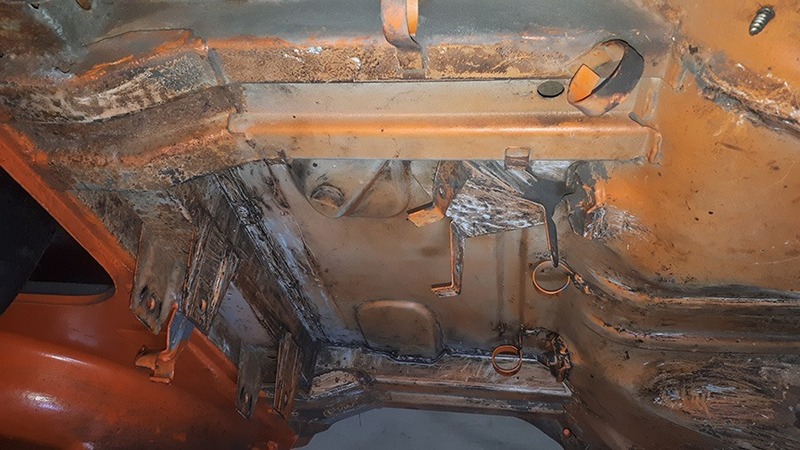 I believe my car had factory installed undercoating as the undercoating is evident where you could not spray it after the assembly of the front and rear suspension or drive tunnel without getting it on the suspension and driveline itself. 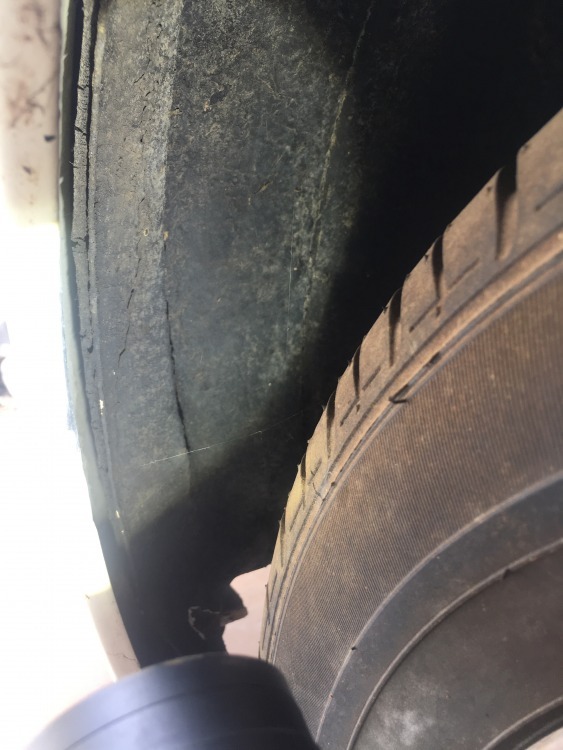 I have observed that additional dealer installed rust proofing in the doors and interior of the side panels, behind the headlights, in the spiders of the front and rear hoods, and sometimes, if you observe drill holes with plugs in the door sills, sometimes evident under the plastic tread. You might send an inquiry to Richard Stern in England or Norbert in Germany. It is quite possible, although I have not seen it myself. There was no sign of any undercoating on my car when we stripped it and I know it had not been completely stripped before I got it. There had been some bodywork done, mostly in the nose, so I don't know if the braces behind the grills were painted black originally. It is possible that in Europe they may have undercoated them, I just have never seen a US delivered car that was done at the factory back in the '70's. There were a number of aftermarket companies that offered Rust Proofing and even offered a "warranty" against "rust though" if you had it done when the car was virtually new AND had it inspected and re-applied as needed (Ziebart comes to mind) This was much more common on the East coast and other places that used salt in the winter from what I remember. This was not very common in Washington state back then. 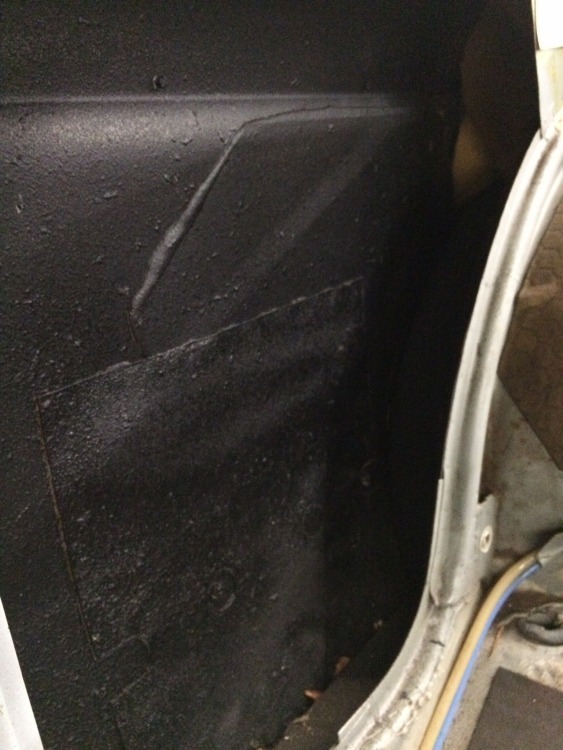 Here's a picture of one rear wheel well where I tried to remove the undercoating and another of the inside panel with the anti rust. The car came from England via IIRC Belgium. I can't seem to find images of other Turbos, but recall one I saw a year or two ago at the Brisbane event that came from France. That car was not restored and had the undercoating I have. 1. Drilled holes, including under the door saddles, sound far more like post-factory undercoating than a factory process — as Byron mentions, there was lots of this done in the U.S. Northeast — where I grew up, and could watch the Zeibarted cars rust! I wouldn’t be shocked if similar treatments happened outside the U.S.
2. Anything in the Taylor book is immediately suspect to me: the book is riddled with inaccuracies, mis-statements, and an embarrassing unfamiliarity with ‘02’s. Going back to frached’s original question, wheel wells were Schutzed and fully painted body color. ‘02 undersides — by which I mean the floor pans, the underside of the trunk floor, etc. — however, were miserably finished, generally showing more primer than color coat. If you see an ‘02 — any ‘02 sub-model — with a decently or well-painted underside, the underside has been re-painted post-factory. We’ve discussed underside painting previously in multiple threads — none of which I could immediately locate — but the photos below shows typical undersides, these on Agave and Inka round taillight cars. The gray is the factory primer with merely an overspray of the body color on top. I have to say, that looks just like the many “Zeibarted” cars I grew up around. Applying it over the full body color in the wheel wells is a shocking aesthetic change, as body-color wheel wells are dramatically different from “blacked-out” wheel wells. I’m not saying it absolutely didn’t happen, but I’d wonder (a.) 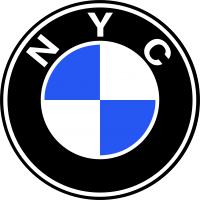 why BMW bothered to do it, and (b.) why it only appeared on a few examples. I also sprayed some, although not as uniformly, on the underside of the passenger compartment floor pan. I made no efforts whatsoever to remove or reverse these finishes at the car’s recent re-painting. Yes, I agree that at least on my car, the rustproofing was done post factory. AND I agree with you on the Taylor book...e.g. all Turbos came with the CR steering box........Don't get me started; the Macartney book has inaccuracies as well. I consider them just another reference to perhaps confirm / not confirm in this "Where's Waldo" information world. An interesting note, and I can't remember where I saw it separately and originally, is that if you go to W&N and search for window stickers for the Turbo, up comes one for Tectyl, which is the black undercoating. Come to think of it, and I didn't think to take a picture of it at the time because it wasn't significant, I saw an unrestored Turbo #0076 (silver) for sale at Moda de Epoca in Italy in 2010 that had the black undercoating. OK perhaps there was a respray as the area under the sills were not painted black, but not in the wheel wells. Perhaps it is an "early" or "late" production thing. An easier way to find out would be to e-mail Richard Stern and Norbert to see if they can confirm. Here are some follow up pictures which seem to confirm that the wheel wells were painted the color of the car at the factory. This particular vehicle is a polaris turbo. The car was heavily coated in cosmilene for storage and rust prevention, at some point in its life. Below the cosmilene was black undercoating which may or may not be factory applied ( yet to be determined). Upon removing the black undercoating, a layer of polaris was found and then the gray factory metal primer. This allows me to conclude that the factory did paint the car color in the wheel wells. I will also try to make this determination on the floor pan as well. Additionally, I am including some photos of what appears to be the factory yellow final assembly quality control marks. 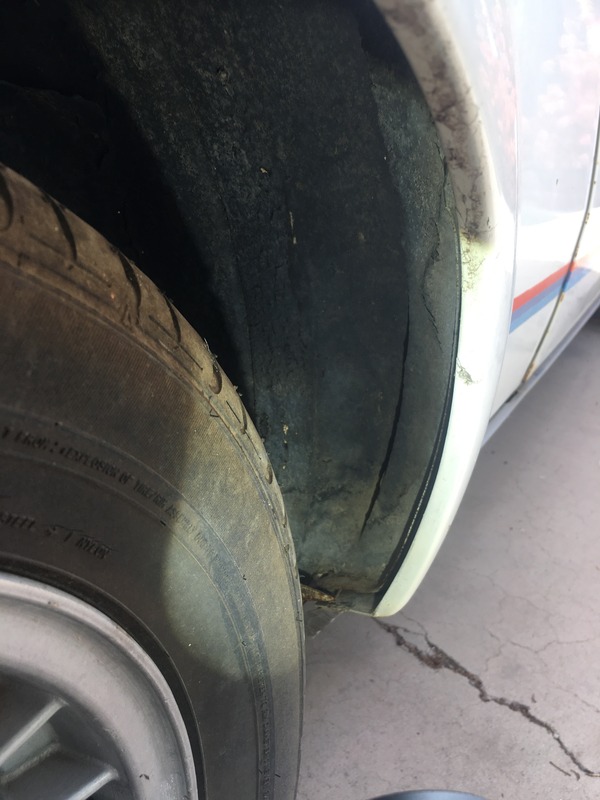 This indicates that, other than bushing replacement and maintenance, this undercarriage has been unrestored don this vehicle. But we need to clarify terminology used in discussion. ALL 2002s had the body color paint in the wheel wells and some was painted on the underbody, say under the trunk, within the front panel. On my car, the transmission tunnel was painted white over the factory primer. Other 2002s had just the primer there, where the overspray didn't get from painting the door sills. In addition, it is my observation, on OE and not necessarily restored Turbos, that the area under the door and thus the stainless trim was painted black. Cosmoline ( a trade name) or other derivatives is a tan colored wax spray that was used both by the factory on car models after the 2002, and by the aftermarket on 2002s. 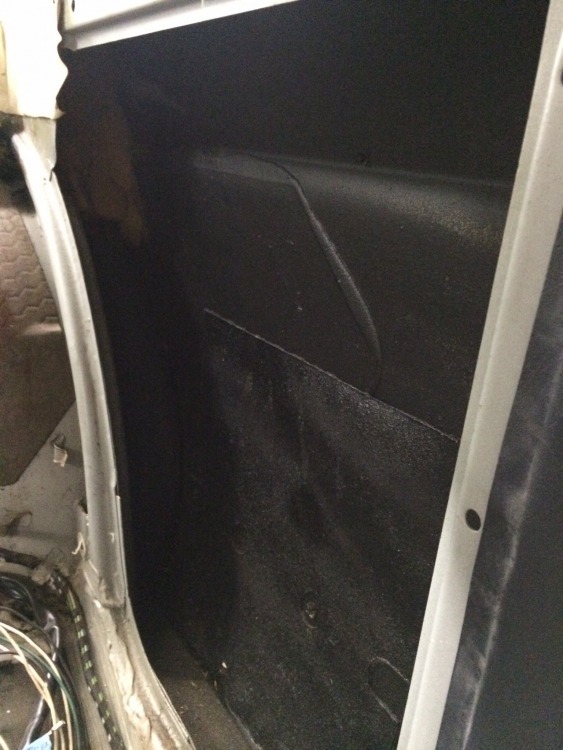 It was applied mainly within the doors, behind the rear seat panels along the body panel, shown in my previous pictures. Another anti rust product that was applied in the aftermarket is trade named Ziebart, also tan in color. UNDERCOATING is generally an asphalt or rubberized product sprayed over the paint in the wheel wells and the underbody of the car and NOT in say the doors panels and enclosed parts of the car. The product in question here is BLACK. On my car, the product is of the asphalt type (tectyl) and is NOT sprayed on the suspension, though on the body panels behind it, leading me to believe that it was a factory application prior to assembly as most aftermarket applications the suspension was coated as well, probably overspray. The challenge for me with the pictures you posted is that it is hard to tell if that is undercoating or just an accumulation of oil and grease. On your Polaris car, the car was sprayed with primer (grey?) then Polaris, then the black coating as you describe. Can you determine if the accumulation on the suspension is "old grease and oil" or undercoating? Ted (Einspritz) has addressed the topic of body color — painted over body schutz — in the wheel wells. There is really no debate on the topic of body color within the wheel wells: it was the rule. If you clean 100% of the black gunk off the underside of the floor, I believe you will find an unevenly-painted panel, a combination of paint, primer, and overspray. Oh, yeah, there may be a little schutz underlying the paint, but primarily near the rocker panels. And that is the factory finish. The factory underside finish on ‘02’s — including all sub-models — was not impressive. Mine has a black finish in the wheel wells, but the underside of the car is body color. My rockers are still black. Much can be revealed if you take the wheels off and get in there and under the car with a scrub brush and Dawn dish soap as the "quarter" car washes or your pressure washer just aren't sufficient.......I found a few places where the shutz and seam sealer came off needing a "touch up" after removing the surface rust......details. BTW, eastwood sells a spray similar to Ziebart; I used that on the fenders of my M3 behind the plastic panels; i scrubbed off the offending dirt to find that it came from the factory with a similar product........but I digress..